Reposting this Holiday Calendar from last year! 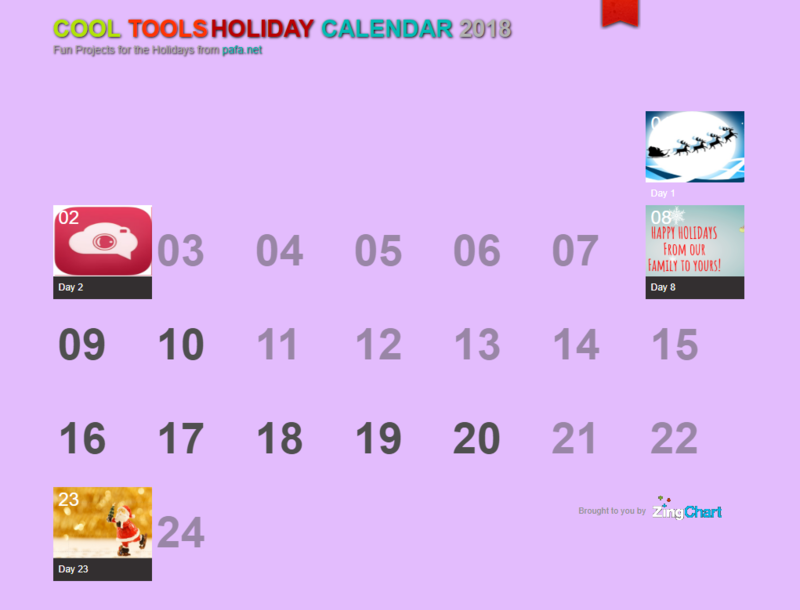 So I’ve created Cool Tools Holiday Calendar of fun winter holiday activities andÂ things I’m finding for our Cool Tools for School Workshop.Â I’ll need to catch up, it’s already December 12!Â I’ll list all the content here too and update as the month goes along. Big Huge Labs has a template to fill out that will create a personalized printable letter from Santa. You can also type your own letter as well. Explore lots of other great creative projects while you’re there. Gather up your favorite photos from the year and set them to music for a slideshow video to share with family and friends.Â Upload your photos and videos, then choose from a limited number of slide show styles and transitions speeds. Music can also be added. Key feature is its simplicity. Free.Â (iPad, Android, Web)Â Â TIP: If you need images with captions or other text, use Google Slides or Powerpoint first to add text and other effects to your photos. Then save/export the slides as regular jpg files to use in your Sharalike video. What a fun way to build a snowman. Write a message, then take a screenshot to email your pictures to a friend. Or how about printing it out as a holiday card.Â Clever use of Google slides! You could create projects like this for other holidays and activities. Create an emoji and learn a bit of coding with Made With Code’s Emojify the Holiday project. Explore the whole collection of coding projects. Choose a piece of artwork from Storybird’s beautiful collection and create your own poem inspired by artwork, refrigerator magnet style. 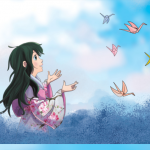 Learn to fold origami peace cranes and learn the meaning of the Peace Crane project. Printable coloring pages for younger kids. Sign up your classroom or group to participate in a crane exchange with another student group. Lots of global connection possibilities here.Use your cranes to decorate packages, create greeting cards or string a bunch together to decorate for the holidays. Books for kids on Empathy, Diversity and the Immigrant Experience. Use this LibraryThing book widget on your own website. If you have a librarything account, try your had at creating your own book widget. Choose from a selection of colorful holiday card designs. Then customize them and download for sharing and printing. Make Rudolph’s nose light up! Or light up a Christmas tree with these fun paper circuit holiday card templates.Â Copper tape circuit supplies are available through Amazon and maybe your local craft stores. A daily selection of early literacy resources for families. Spanish and English versions. Learn about holiday traditions, play games, some simple fun coding games. And of course, the Santa Tracker on Dec 24. What a cool science project! Create your own light-up menorah with copper tape circuits.Â Copper tape circuit supplies are available through Amazon and maybe your local craft stores. Not getting enough spin on your dreidel? Make this simple launcher and watch it spin, spin, spin. 25 Days of The Polar Express: a variety of fun Polar Express-themed games and activities for every day in December up to the 25th! Have fun with Winter Magnetic Poetry created with Google Slides. Just click on the USE TEMPLATE button at top right to make your own copy of it. Move the words around on Slide 1, check slides 2 and 3 for word lists. Thanks to Kasey Bell of Shake Up Learning for this fun activity.Â I bet you can figure out how to make one of your own with different words and a different scene! Have fun decorating the houses with colorful twinkling lights. Choice of an easy (small) or hard (big) word search puzzle. Check out all the fun apps that Shelly Terrell has gathered in this post. Creating gifts, augmented reality, holiday fun and games, and more! Print out these intricate patterns and may the force be with you. Pick one of Pixabay’s colorful holiday images and select how many puzzle pieces you want. Write a message on the back of the puzzle, then share the link with your friends and family. When they solve the puzzle, they can read your greeting.